We have released various fine ep’s of Minilogue on Traum in the past: "Certain Things", "The Leopard", "Seconds", "Space" and the most recent one: "Let Life Dance Through You". 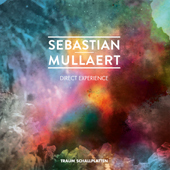 This time we have Sebastian Mullaert’s spiritual work of "Direct Experience" pressed on vinyl ! Two very different versions of a techno soul. You can virtually feel him putting hands on knobs and twisting and bending the theme in his delicate and hypnotic way. Who ever has seen Minilogue play live this feeling is captured here by Sebastian in an authentic breathtaking way. "Direct Experience" in its original version is an 11 minute voyage into Sebastian Mullaert’s art of shifting and moving frequencies gently from one place to the other without ever loosing touch with the pulsating rhythms that carry all of it into your vein. The music is indeed trippy and demands an appreciation for a hypnotic state we happily approve of. The Dub version on the flip side is even more loose and secluded you can feel the music not touching the ground for a bare millimeter. For the digital release we added two remix versions by our Scottish artist Nick Dow and by Hamburgs analogue cyborg Hannes Rasmus as well as two alternative takes by Sebastian Mullaert. Nick Dow’s version is a post Detroit techno interpretation uplifting and dramatic. It has „Jupiter sounds“ kicking in that give the track a touch of the "Night Of The Jaguar"! Hannes Rasmus who has released the high acclaimed "Musik Für Fünf Machinen" on Traum moves the track towards a glitter ball of disco! Guitars are slashing and sound are clashing… Hannes at his best when he has melodies embracing themselves without any reluctance. 1. Direct Experience (Original Mix)	Your browser does not support the audio element. 2. Direct Experience (Dub Version)	Your browser does not support the audio element. 3. Direct Experience (Nick Dow Remix) Your browser does not support the audio element. 4. Direct Experience (Hannes Rasmus Remix)	Your browser does not support the audio element. 5. Direct Experience (Remake)	Your browser does not support the audio element. 6. Direct Experience (Wa Wu We Mix)	Your browser does not support the audio element.